At an elevation of 3,930 ft, Madhugiri is a monolith which is also the second highest monolith in Asia. On its steep slope is a fort, which has three gateways, namely Antaralada Bagilu, Diddibagilu and Mysuru Gate. The name Madhugiri comes from the honeybee colonies which were present at one point of time in the northern part of the Madhugiri Fort. One can also find two temples located here, one dedicated to Venkataramana and the other to Malleshwara. You can also find a Jaina Basadi in the vicinity of the fort. By Air: The nearest airport is the Kempegowda International Airport which is located at a distance of 103 km from here. The airport is well connected to most of the major cities across the country and to a number of them abroad. By Train: Tumkur is the nearest railway station which is located at a distance of 45 km from here. The station receives various trains from different parts of the state and has frequent trains from Bengaluru. By Road: One of the best and most preferred modes to reach Madhugiri is by road. One can choose to drive up from Bengaluru city in his/her own mode of transportation or make use of the less frequent bus which leaves from the Majestic Bus Station and takes you all the way up to the entrance of the hill. Those who want to travel by Route 1, it would take you approximately around 2 h to reach Madhugiri, via SH 3. The route takes you through the well-known towns of Nelamangala, Dabaspete, etc. The roads are well-maintained, which helps one to cover the distance at a good pace and the destination is about 105 km through this route. If you opt for Route 2, it would take you approximately 3 h to cover a total distance of 134 km from Bengaluru to Madhugiri, via NH 44 and NH 69. As the place is very close to the city of Bengaluru, most people head out to this beautiful destination during the weekends. Many prefer to reach here during the early morning hours as the place gives you a brilliant view of the sunrise amidst the greenery surrounding the place. Most people prefer to have their breakfast from the Kamat restaurant on the highway and further proceed towards the destination which is around 55 km from here and would take you about an hour to reach the place. Enroute, you will come across Shivagange, which is a hill located here. The hill has an appearance of a Shiva Linga and hence many people flock here. Another attraction on the way is the hillock of Devarayanadurga and the much famed Lakshmi temple of Goravanahalli. 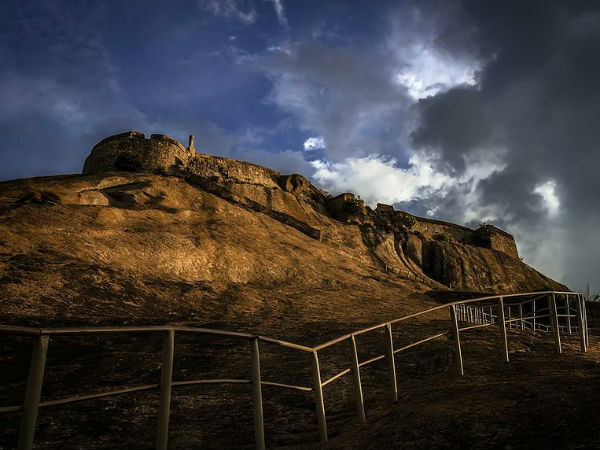 The major attraction here apart from the monolith is the fort atop it, which is well known for its architecture which was built by the rulers of the Vijayanagara Dynasty. The fort is well known for the stone carvings. The fort was constructed by Raja Heera Gowda in the year 1678. Once it was completed, Hyder Ali further added on arches, watch towers and granaries around the structure. To reach the fort, one has to trek up the steep slope. The trek takes about two hours to ascend and about 45 minutes to descend. Trekking up Madhugiri hill would take you past through a series of doors and walls which would eventually take you all the way to the top of the hill. The trek is seen as moderate to diffcult. The walls at various levels pose a challenge to even the most hardiest trekker. About 24 km from here is another popular hillock of Siddarabetta. It is well known amongst trekkers and pilgirms. Many people come here to visit the Shrine of Lord Shiva atop the hillock. For trekking enthusiasts the place offers you caves and even boulders which give you a thrilling experience.